Everyone has their favourite season, and you could drum up a lively debate about which one is best. For some people autumn represents only the impending return of winter, but to me it’s the most sensual season — if you take the time to appreciate it. Forget the equinox date — to me autumn begins when kids return to school at the beginning of September, just as winter feels like it really begins at the beginning of December. I loved starting school again each year, but it wasn’t just the return to classes and the schoolroom — it was picking out a new dress for the first day of school, buying new school supplies (I’ve always loved the smell of new notebook paper! ), walking to school as the leaves began to drift down until every step became crunchy, the screech of blue jays on chilly mornings, eating a hot bowl of oatmeal with cream and lots of brown sugar, the scent of grapes growing in neighbours’ yards, Thanksgiving turkey with stuffing, and the building excitement as Halloween approached. For a couple of years my family lived on a farm in northern Ontario, where autumn is extravagantly beautiful — great swathes of colour lining the winding dirt road that we walked to and from school, the tang of wood smoke in the crisp clear air, gold-tinged fields rolling away under a bright blue sky… Moving down to southern Ontario brought a gentler season but better opportunities for trick-or-treating in a more urban area. How I missed the wonderful autumns of the north, though! I’ve taken my hubby Mike up to northern Ontario a couple of times over the years so that he could experience a bit of what I loved so much. Autumn has become our favourite time to travel almost anywhere (except parts of Africa) — to enjoy the milder weather and fewer crowds, to enjoy the outdoors, and quite a few times to enjoy Halloween events. The first time we went to England was in early November, and we had a fantastic time. We bundled up in trench coats and toasty sweaters, had tea in cozy pubs by the fire. We visited Stonehenge on a cool, cloudy day, but besides us there were perhaps only about a half-dozen other people about. All the cities and towns had Christmas decorations out, so we had great fun in Oxford buying little university sweatshirts as gifts for all our tiny nieces and nephews. I remember driving down a country road to Bath in the dusk and watching autumn mist creep down the hillsides — if a Druid had come floating through the trees collecting mistletoe I wouldn’t have been at all surprised. October in Paris is equally enticing. We had a chilly day on the Eiffel Tower, which gave us the perfect excuse to visit the café on the second level for a thick, dreamy Chocolat Chaud Viennois (rich hot chocolate with a generous helping of whipped cream on top). Autumn is the perfect time for a road trip. 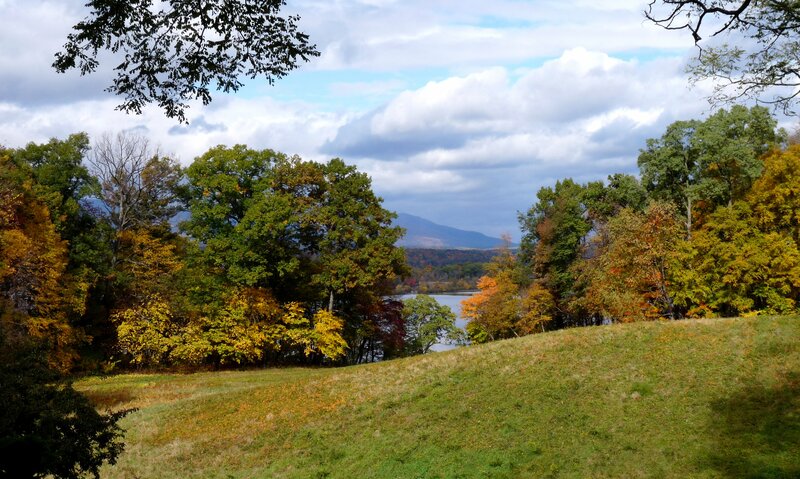 One of our favourite places to go is the Hudson River Valley in New York State. There are magnificent old estates dotted along the river, lots of great hikes, delightful small towns to poke around, plenty of history, an abundance of farmer’s markets with fabulous artisanal food (can’t give you names, just stop in at any market you come across), and best of all for all Halloween buffs, this is Washington Irving country. The denizens of the Valley make the most of the whole Legend of Sleepy Hollow and Rip Van Winkle atmosphere — in fact, there’s a real town called Sleepy Hollow where you can walk across the Headless Horseman bridge and visit Irving’s grave in the very old cemetery (which you can catch glimpses of in the new TV series that just debuted this week). Irving based his tale of the Headless Horseman on a genuine old legend, and believe me, if you wander up into the Catskill Mountains you’ll get some eerie shivers when the wind moans through the forests. There are a ton of Halloween-themed things to do, including the Headless Horseman haunted farm, which is the top-rated haunted attraction in the U.S. and an absolute blast! In our increasing urbanization, people are missing out on many of the sights and sounds of autumn. It’s not a season to be depressed about — it’s a season to celebrate as Nature puts on her finest show, but you may have to go looking for the best stuff. Go hike in the woods and breathe deeply of fallen leaves. Visit a fall fair and buy some good home-made sausages and apple butter to take home for dinner. Have a picnic on a plaid blanket spread out on the leaf-strewn grass, with a thermos of tea, some sumptuous sandwiches and crumbly pumpkin squares for dessert. Line your porch with pumpkins of all shapes and sizes, then enjoy chocolate eyeballs and some cheesy old sci-fi movies for Halloween. Life is too short not to make the most of this most glorious season.